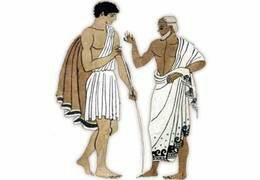 The origins of the word “mentor” go back to the ancient Greeks. Odysseus appointed “Mentor” who was to oversee the teaching of Odysseus’s son Telemachus. From this the word “mentor” has evolved to mean trusted advisor, teacher and wise person. So, the concept of mentoring has been around for many centuries, and, today, is seen as an integral part of organisational management. “A mentor is an experienced and trusted adviser who takes a custodial interest in the progress of another.” That word “custodial” gives a hint as to the nature of a mentoring relationship. The process of mentoring is one which incorporates a solution focused approach, using a range of skills, tools and behaviours. Each conversation will be structured in terms of outcomes and steps to success. Change, learning and progress will be the main criteria. It is interesting to note that in certain parts of the world, cultural sensitivities dictate that one is far more likely to find mentoring relationships within an organisation, than coaching ones. One often finds evidence of mentoring as a concept being well established and indeed endemic, in societies where there is a respect for status and an unquestioned deference to those in senior positions. Both mentor and mentee feel far more comfortable with the unequal balance of power inherent in a mentoring relationship. Indeed, it could be argued that the concept of being allowed to claim complete ownership of their own learning, is something which is quite foreign to their view of the world, both professionally and personally. The characteristics of “advice,” the potential for a less formal environment for conversations (which will allow for spontaneity that is particularly attractive to non-Western cultures) the building of a long term and perhaps more personal relationship, and the opportunities for patronage, are those which particularly appeal. Since successful mentoring is, in essence, about development of the person being mentored (www.invesorsinpeople.com) it makes sense that in the case of young adults, mentoring can be particularly valuable. 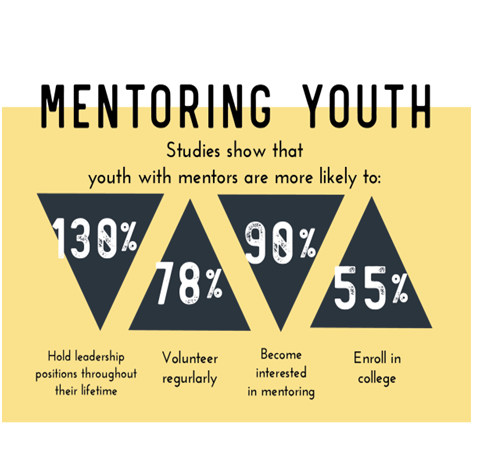 This value should be viewed, not only in the context of young adults being mentored by more experienced and older individuals, but also in helping them develop mentoring skills to mentor each other. The skills required for effective mentoring will benefit them in many different ways, not least in enhancing their ability to work collaboratively, to communicate effectively and to prepare them for the challenge of a marketplace that requires increasing flexibility and resilience. The image below depicts some of the advantages “youth mentoring” gives to those who participate in its practice. If we look at the above, it is interesting to consider the percentage who “volunteer regularly” – this seems to me to inject the concept of altruism into the equation. Not only do mentees have explicit advantages over non mentees but also benefit from something less tangible, but perhaps of even more value when considered through an holistic eye. “Mentoring style” language and techniques lend themselves particularly effective to parents mentoring their children. When appropriately and effectively practiced, communication between parent and child can be enhanced through the use of mentoring dialogue. It enables the parent to dispense advice in a supportive rather than an instructive way as it allows for some ownership by the child of their learning. This more collaborative approach provides an ideal model for both parties. Being an executive in an organisation suggests that the individual is in a position of leadership, of having responsibility for others. It could be argued that they, even more than others, benefit from a mentoring relationship in several key ways. A mentor will help them to assess their own performance and to assist in focusing on their development. Secondly, and most importantly, a mentor will be able to provide confidential feedback on the executive’s strengths and weakness, as well as pointing out potential challenges. Part of an executive’s role is be in a position to call on other professionals, to have an extensive network, and a mentor can help by introducing them to his or her own contacts. Because a mentor is in it “for the long haul” their approach and commitment to the process is a long term one. An executive will likely benefit from the age and experience a mentor brings.